I ended up getting a 3W LED flashlight from Cabela's, for $20+shipping. The nominal output of these lights is 65 lumens, which comes from a single Luxeon LED. 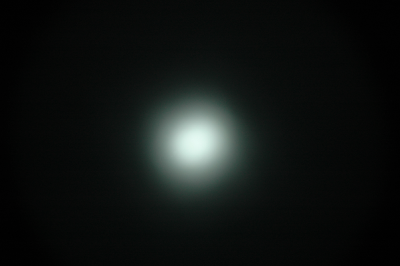 Without further ado, here is a picture of the output (widest setting): The picture was taken at 2m (6.5ft), with the following camera settings: 1/12s exposure, f7.1, focal length 29mm. I took care not to overexpose the photo. 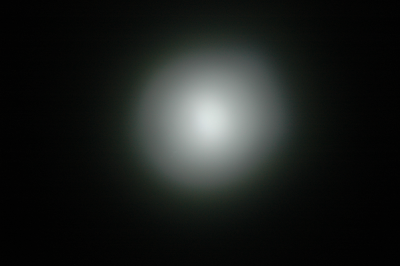 If you look at it with a photo-processing application like Adobe Photoshop or the Gimp, you will notice a faint illumination (ranging from 20% to 5% of the peak) even outside the readily apparent white circle. For comparison, here is the light of the Dinotte with the same settings: Of course, the difference is obvious: the Dinotte is rated at 200 lumens, and has a much nicer lens to spread the light wider. Nevertheless, I am satisfied with the flashlight's performance, especially considering its price. Now I am experimenting with different mounting options (Twofish lockblocks should be arriving soon), and will post my experiences.